Bragi announced its Dash earphones at CES way back in 2015, when wireless Bluetooth headsets were still relatively niche. Since then we've seen Apple, Samsung, and a host of other companies launch their own "truly wireless" headphones, prompting Bragi to give the market another pop with "The Headphone" ($149), a less expensive, more awkwardly named variant of its original cord-free buds. Announced last September two days before the Apple iPhone 7 event, The Headphone only began shipping in January, so Bragi has had plenty of time to iron out any last-minute kinks. Not that there should be any. The Headphone buds are a lot less ambitious than the Dash. They don't have touch-sensitive controls, for one. 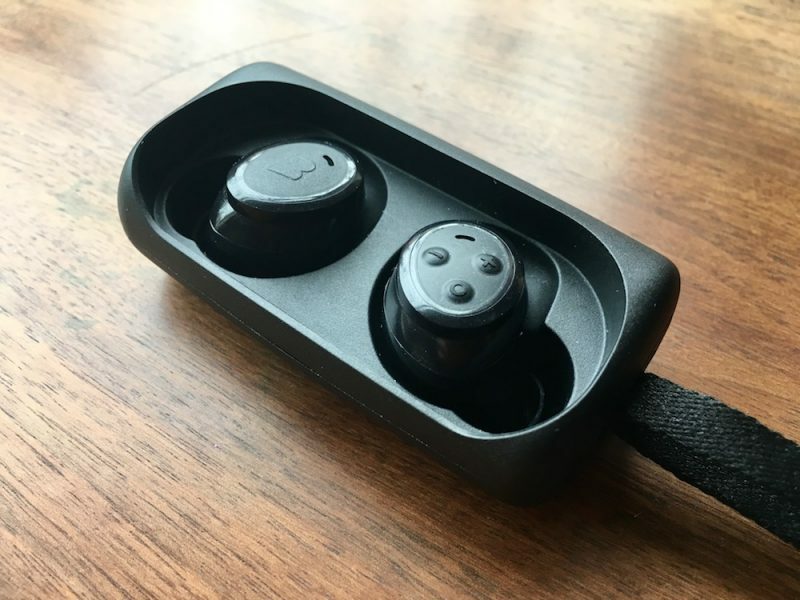 Bragi has also done away with the internal music player, heart-rate monitoring and fitness tracking features found in the company's original wireless buds. Are they susceptible to the same connection problems that initially befell the Dash? 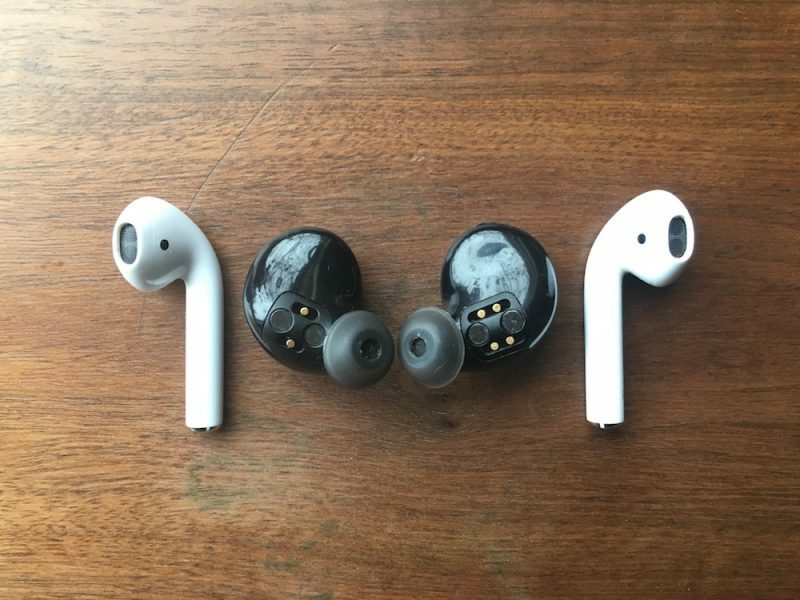 And how do they compare against Apple's AirPods? Let's find out. 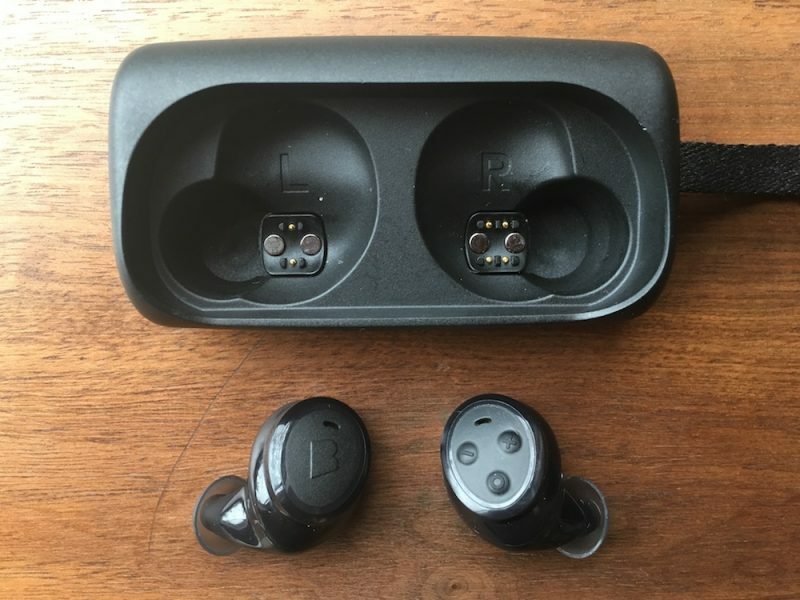 Bragi has chosen to go with a more minimal packaging style for its latest audio product when compared to the Dash. These come in a compact rectangular cardboard box about the size of a cigarette packet, with a top that levers up for you to slide out an inner compartment. Tucked inside is a black carry case connected to a lanyard, a micro-USB to USB-A charging cable, two pairs of FitTips (small, medium), a pair of large Comply foam eartips, a quick start guide, warranty information, and some stickers. A quick look at the documentation seems to confirm there's no accompanying Bragi app for these buds and no obvious way to update the firmware. 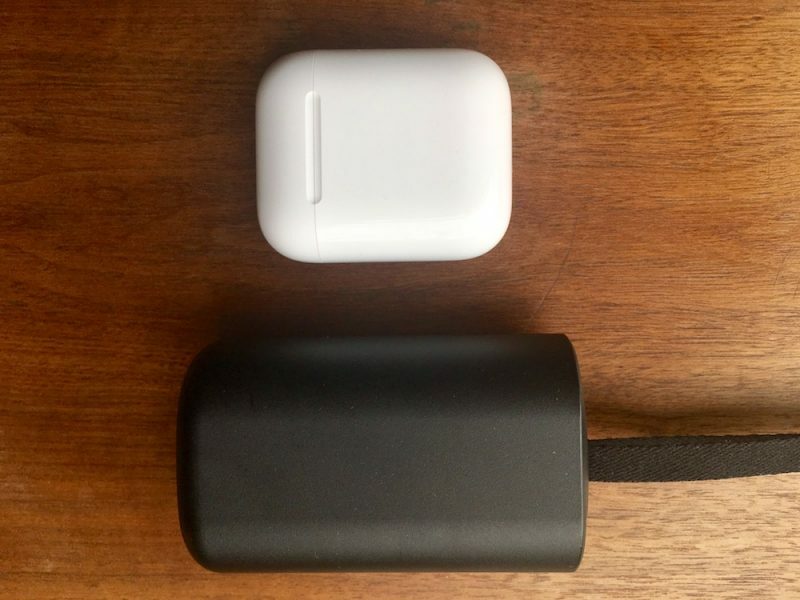 The carry case is all-plastic (as opposed to the metal Dash case) and despite being significantly bulkier and less pocketable than Apple's AirPods case, it actually feels slightly lighter in the hand. There's a good reason for that, though – unlike the Dash and AirPods, The Headphone case packs zero on-the-go charging capability. Another thing that distinguishes The Headphone from the Dash buds and AirPods is its lack of waterproofing. Fortunately the buds are splash-resistant though, so they'll be fine for sweaty ears and running in the rain. 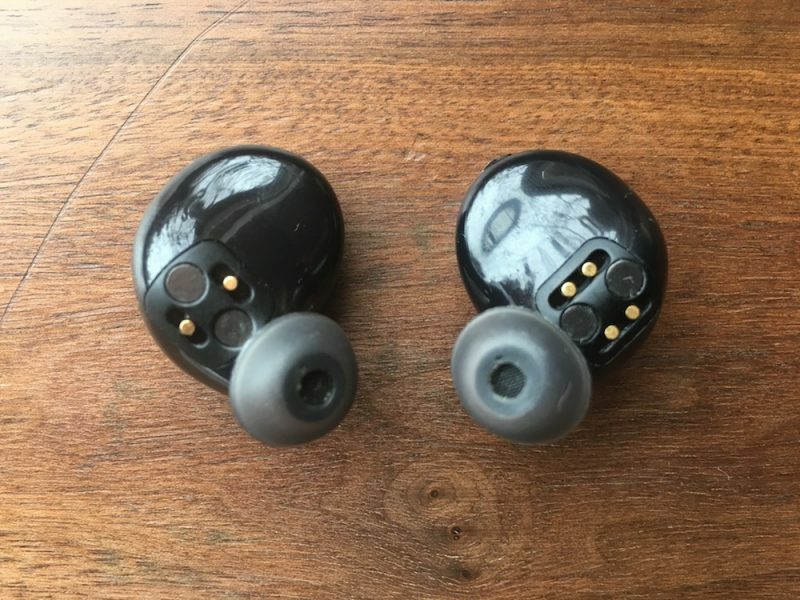 The earpieces don't look very "premium" at first glance, but a closer look reveals a neat ergonomic curvature, with a little arm emerging from the body of each bud where the eartip and driver are located. Overall they feel robust, yet lightweight and well balanced in the hand, despite all the button controls being located on the right earpiece. Using the three physical buttons, you can skip through tracks, take calls, make voice commands via Siri, and activate audio transparency (more on that later). 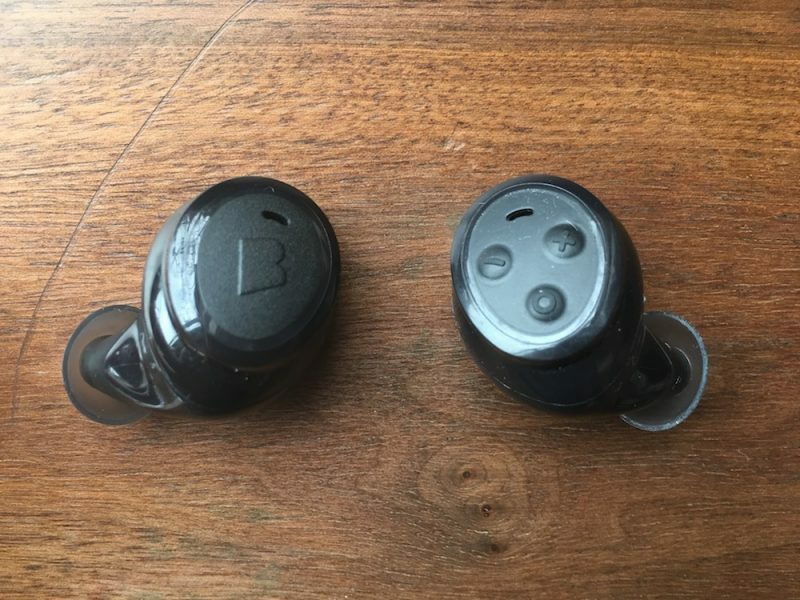 The only feature on the left bud is a small raised Bragi logo on its back. The buds line up with gold charging contacts and magnets in the case, and snap back in easily, but they don't automatically turn off once they're inside, so don't get caught out if you're used to a case with a built-in battery charging feature. 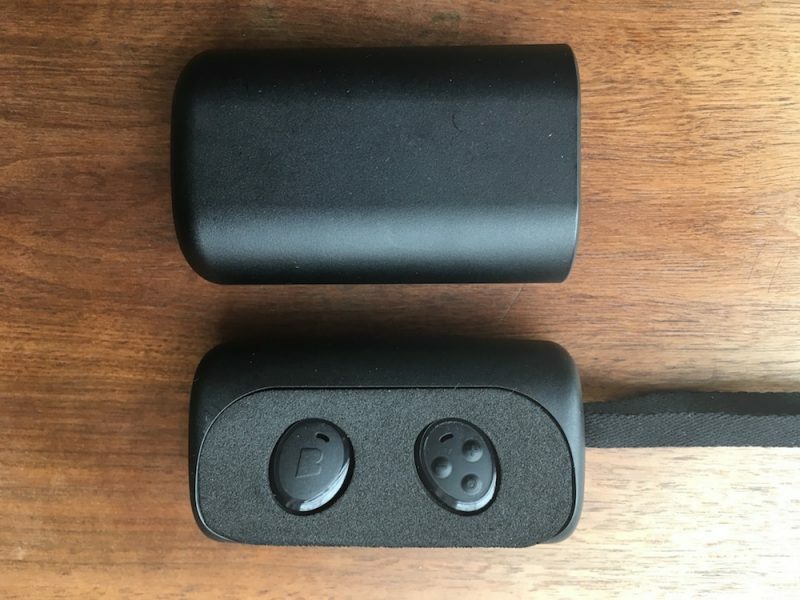 With the buds in the case and the case attached to a power source via the USB cable, the LEDs on both earpieces blink until fully charged, then stay illuminated. Pairing The Headphone is pretty straightforward. Pressing and holding down the power button sets off a flashing arc of light on the right bud, the Near Field Magnetic Induction kicks in and connects the pair of them together, and they show up in your Bluetooth settings as a single headset. Using the large Comply tips, the buds fit inside the hollow of my ears nice and snugly – maybe too snugly. The buds never threatened to work themselves loose while I was out on a run, or pop from my lugs during circuit training exercises, but the drawback to this level of security turned out to be my sense of relief upon removing them. The earbuds aren't uncomfortable to wear exactly, but after wearing loose-fitting AirPods for an extended period, The Headphone buds' embedded seal feels a tad constricting. This sensation isn't really diminished by using the smaller FitTips, either. On the upside, The Headphone buds are much easier to hide or disguise than AirPods, if that's a concern, and they do a heck of a better job at blocking out ambient noise than Apple's wireless buds, which sort of blithely hang in the hollows of your ears and let in any old commotion going on around you. The Bluetooth connection between my iPhone and The Headphone was also very reliable during runs, even with my phone secured against the small of my back in a waistband. The connection even remained firm while I tottered between two adjacent rooms indoors, so it's safe to say they have at least one up on the original Dash. The audio transparency feature is meant to let in ambient noise when you want to hear it. A long press on the volume up/down buttons turns the feature on/off. I didn't get much out of it, to be honest. The noises it allowed through were in the high-pitch range, and didn't significantly increase my awareness of my surroundings; it just made the sounds around me more distracting. With the original Dash headphones, swipes and taps on the buds' touch panels controlled music playback, while gestures let users nod or shake their heads to accept or reject phone calls, all of which could work haphazardly or feel too sensitive in practice. With physical buttons and no gestures, none of those issues are present with The Headphone buds and they respond a lot better as a result, although the buttons aren't very "clicky" and you can end up pushing the earpieces further into your ears when you press them, which isn't a nice sensation. The buttons' positioning takes a bit of getting used to once the buds are in, but removing them pauses your music and putting them back in resumes playback, so presumably there's a sensor tucked away inside them, which came as a neat surprise. The original Bragi Dash have a measly three hours' battery life; The Headphone managed around five and a half hours in my tests, just shy of the stated six. That's marginally more than Apple's wireless buds, but the difference is nullified by the AirPods' carry case, which can hold an extra 24 hours of charge and fast-charge the pods in 15 minutes for an extra 2 hours of juice. Once you lose that convenience, you quickly miss it. In terms of sound quality, The Headphone's bass was a bit too much for my liking, and seemed to overpower other aspects of certain music types. Hip-hop and dance sounded okay, but instrumental and jazz sounded awful, and there was some faint distortion in the upper end. I definitely prefer the clarity and openness of the AirPods. Taking calls through them, on the other hand, was fine. Speech sounded clear enough, and I was told my voice came through loud and clear. The buds' integrated mic isn't quite good enough to dictate text messages accurately, but it works fine for making calls in a moderately quiet environment. 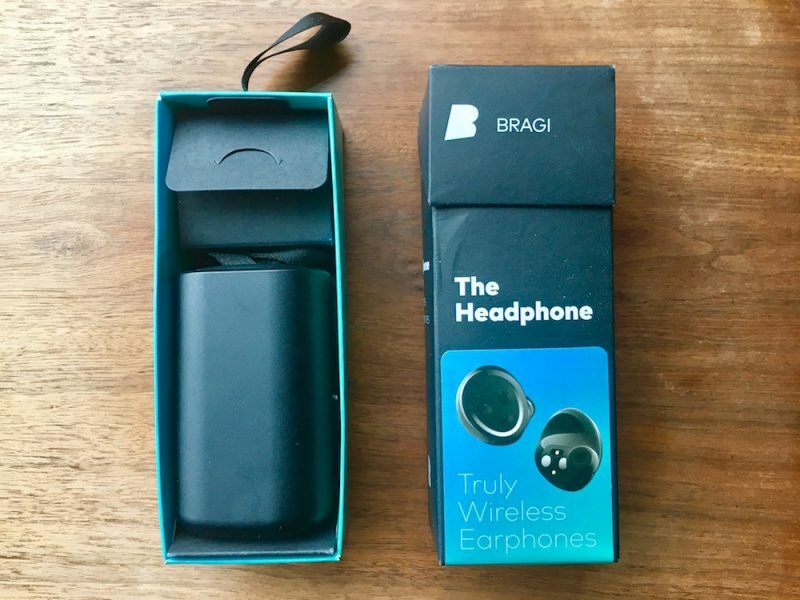 They may lack Apple features like W1 seamless device pairing and an on-the-go charging case, but at $10 less than the AirPods, The Headphone by Bragi is a viable, discreet option for anyone interested in going "truly wireless" but isn't convinced by what Apple's offering. The sound quality isn't amazing by any stretch, but these are relatively inexpensive isolating Bluetooth buds and should satisfy most users as long as they accept that they're buying into an audio compromise for the convenience of not having to worry about wires. 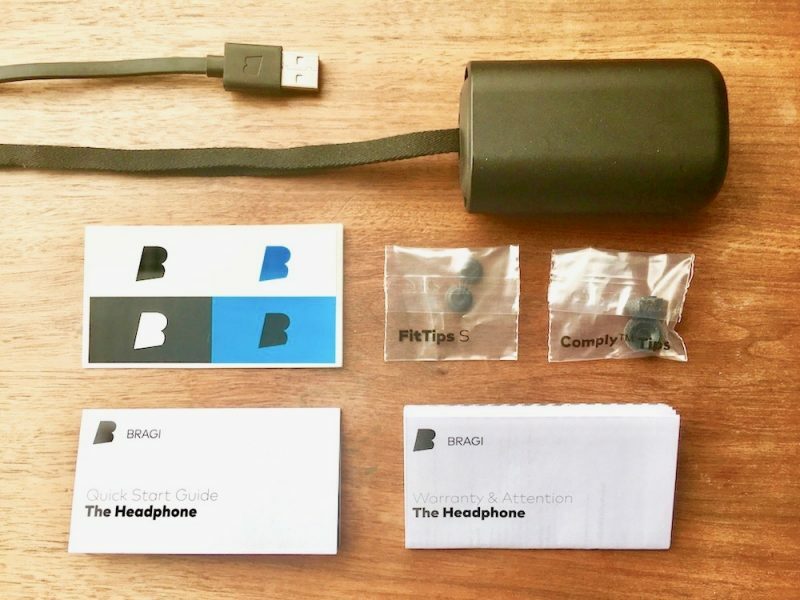 The Headphone by Bragi costs $149 and can be ordered from the company's website. Note: Bragi supplied The Headphone to MacRumors for the purposes of this review. No other compensation was received. Bought the AirPods and would have kept them, but was deeply disappointed by the EXTREME hissing sound as soon as the microphone kicks in while doing phone calls etc. Not talking about normal Bluetooth basic hissing I guess/hope, but really, really bad. A pity as I would have loved to keep the AirPods. Perhaps they were a bad pair…? Mine do the same thing - it's especially bad on Mac. I'm not sure why, but whenever my 2015 rMBP tries to use the Mic on the AirPods, the audio quality is absolute garbage. I wouldn't cope without the back up charge that offers the Airpod case. I think the only thing Bragis the Headphone have that airpod lacks is the black colour. Very happy with the Airpods. It sounds like you had a defective pair. There is no hissing on phone calls with my AirPods. I bought the first version of Bragi s earphone and what should I say ... never again. They didn't fit, I lost one -- no replacement available ... . I will avoid this company like a plaque. Agreed. The Airpods are a success. I use mine for weightlifting all the time. As far as a black color, that's guaranteed to happen with Apple exoanding The line. I have used both. The main advantages of the Headphone are noise isolation (with optional passthrough via the "transparency" feature) and controls to start/stop/skip songs and adjust the volume. They have different strengths. The Airpods are almost useless in noisy environments such as airplanes, but they are more comfortable and "airy" when it's reasonably quiet around you. The Airpods are also very good for phone calls. The lack of an easy way to adjust the volume on the Airpods is a serious drawback IMO. The Headphone has a more secure fit when doing vigorous exercising or similar. The volume controls and skip/play dies not bother me at all because i use Apple watch and much better /easier in my opinion but for someone who does not have AW it can be an issue. Also the noise reduction is not an issue for me. I don't like to have my hearing totally isolated from outside when I am listening music. Review needs pic of these things in your ear. Side profile shot of head. Say wut? Not aware of hissing on mine? [doublepost=1488846743][/doublepost]"in 2015, when wireless Bluetooth headsets were still relatively niche." Um, BT headsets have been mainstream for a dozen years.